Are you (or a student you love) naturally good at taking tests? Do you have to do minimal, or no, studying for your chapter tests… but then suddenly discover you’re not ready for final exams? It’s frustrating, isn’t it?! The info got into your short term memory enough for the chapter test, but then disappeared by the time finals rolled around. A client of mine discovered he was in this situation related to his Spanish final exam. In this video, I tell you more details about how I worked with this client over the course of the semester, knowing full well that he might have a harder time come final exams, but wanting him to see it for himself. My patience paid off, and now he is motivated to do a new study tweak this upcoming semester that is going to save him time NEXT time finals roll around. In this video we learn that even if you do not have to study each test during the year you may need it in the end when it comes final exam time. 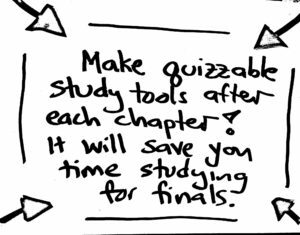 The best way to overcome this in the future would be to create a quizzable study chart after each chapter for the review for your final exam! If you are a teacher, tutor, or academic coach, or perhaps even a parent, interesting in learning more about not only tiny habits but about how to help your students become independent learners and test-taking powerhouses, please consider checking out my course Should I Grow My Biz As An Academic Coach?